Summer is just around the corner, and more women are wearing high-heeled shoes. Scientists say that most of us make about 19,000 steps a day. And it is difficult to imagine that for all our life we go through a distance equal to the distance from the Earth to the Moon. And some of us go through it on high heels. The inventor of the first footwear is unknown, but US archaeologists have discovered a large number of woven grass sandals, and referred their finding to the time of the Stone Age. They say men invented high heels for personal use. These were farmers from ancient Egypt, who used heels as a prop to make it easier to move through loose soil. Later on men’s heels were adjusted to boots helping riders keep in saddle. They say that Leonardo da Vinci invented something resembling the modern heel. However, inEuropeheels became widespread only in the XVII century. In 1680, women began to wear shoes with such high and thin heels that they could move only with a cane. Men also began to wear high heels, and emperors issued decrees, which prescribed what class was allowed to wear high heels. The highest heels were worn by members of the royal family and the noblility. 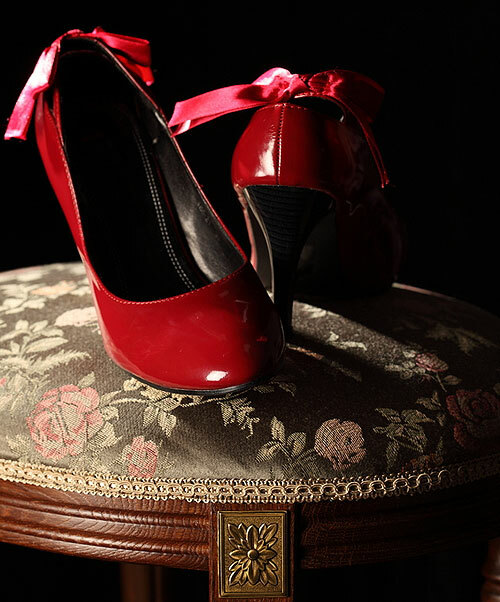 Red heels were allowed to be worn only by the nobility. Is it because of that Christian Louboutin has chosen the red sole as a distinctive sign of his footwear? In the XVIII century, men stopped wearing high heels, and the most fashionable heels for ladies were up to 10-12 cm high. It was believed that such heels made the female figure graceful. The French Revolution of 1789 ended the torturing of women’s health for as much as 50 years. Women began to wear shoes with flat soles. Even at balls, women danced in silk shoes with leather soles. At the end of the XIX century, fashion for high heels returned. • Thin high heels make plump legs even plumper, and the whole figure seems overweight. However, wide and low heels obscure the disadvantages of the figure. • Skinny legs look like stilts on high heels. But a low and not very thin heel makes such legs graceful. High heels often cause irreparable harm to health. They cause spinal curvature and varicose veins. Doctors in all countries say that heels higher that 5cm are dangerous. How High Should a Shoe Heel Be If You Want to Have a Healthy Spine? Dr. Maria Cerutti studied women aged up to 50 years and found out that those whose foot was at an angle of 15 degrees to the ground (the rise of the foot when wearing 5 cm heels), posture remained as good as in those who wore shoes without heels. However, even such heels should not be worn for more than 4 hours per day. How Do High Heels Harm Your Health? If a woman often wears high heels, she walks as if on her toes, causing blood flow disturbance. Nail plates weaken and start to crack, fungus and callosity appear, and feet swell. These simple tips should help high heel fans. High platform shoes are beautiful and safe for feet. Doctors say that if you go to work in high-heeled shoes, you should change them for flats in the office. During breaks and after work it is useful to massage feet. In the evening, make a warm footbath with potato peelings, grass, wormwood or sage. While sitting at the computer, it is useful to take off your shoes under the table and do a simple exercise activating blood circulation – pull the toes to yourself and then stretch them. At home, it is helpful to sit with your feet raised or lie down for some time with your legs on the bolster. If your legs are swollen, a cool footbath will help. And in order not to have problems with your feet, you should probably start wearing flats and put on high-heeled shoes very rarely, only on special occasions. After all, the beauty of a woman does not depend on high heels, but it depends on her self-confidence, ability to present herself, a sincere smile and a friendly attitude towards others.